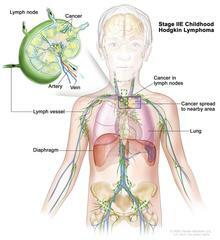 Stage IIE childhood Hodgkin lymphoma; drawing shows cancer in one lymph node group above the diaphragm and in the left lung. An inset shows a lymph node with a lymph vessel, an artery, and a vein. Lymphoma cells containing cancer are shown in the lymph node.